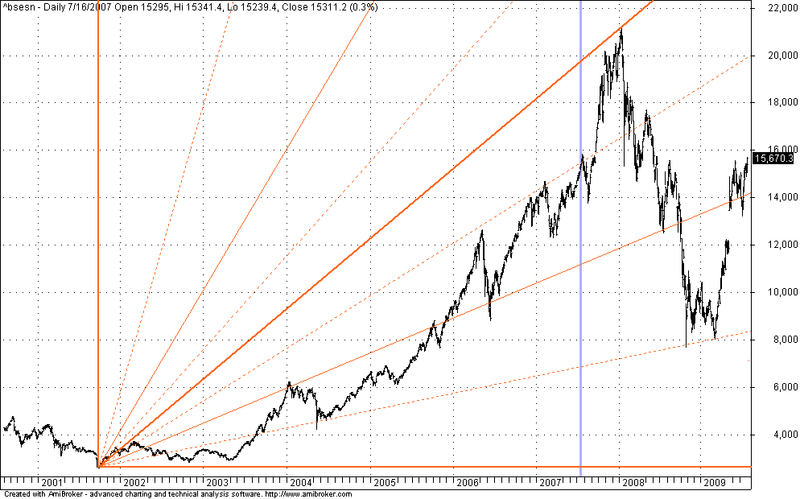 GANN FANN chart for Sensex drawn between the OCT 2001 Low(2600) and Jan 2008 High(21,000). Check out the Support levels. And How Sensex Behaved near the Gann Supports. dear rajandranpls HEROHONDA AND MARUTI GANN CHARTS AND ITS SUPPORT AND RESSISTANT LEVEL GIVE ME PLS AND HEROHONDA POSTING NICE VERY NICE RESULT THEN WHY AFTER THAT IMMEDIATLY START DOWN SUCH SO FAST ANY THING WRONG WITH HEROHONDA? PLS REPLY ME . dear rajandran, please guide online yahoo our technical calls very good please explain stoch method post u r blogs….